So let me start off by saying that you cannot use a Record #043 (or any grooving plane, really) to make a stopped groove. Didn’t take me but a few passes to realize the skate was going to cause issues with that. Ah, well. Blended shop it is… out came the palm router with the 1/4″ bit. After a few minutes of setup, it was ready to go and the grooves were grooved. Can I get back to my iTouch now? Then… life happened. Nothing big, just… life. Things to do, baby gets sick, family visits – you know, “life”. My other worldly challenges seem to be severely impacting my ability to get into the shop with any regularity these days. I find maybe an hour or two in a week to get down there. And sometimes I end up just cleaning or doing some organization or… sharpening of tools. And an hour isn’t enough to make headway on most of that, much less also work on the current project on the bench. Last night I listened to Game #3 of the World Series (again… nice to be in a “hand tool mostly” shop) while I mortised the lock for the box. Ugh. Talk about nervous. 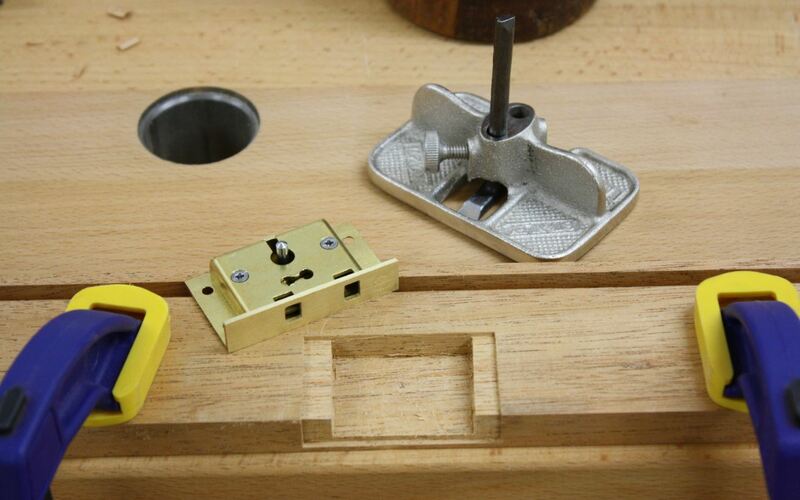 The easiest time to mortise such a lock is when the box is not yet assembled. I just get a bit antsy doing work like this when I’m already behind schedule and really don’t want to cut a new board if I mess it up. But slow and steady wins the race, as they say. (You know… “them”.) It helps that I use higher quality locks from Whitechapel LTD; they are made in England and somewhat costly, but the relative ease of installation is worth it, as is the good feeling I get from knowing I’m using quality products. When it comes to my woodworking, I avoid anything with “Made In China” located on it at all costs… even if it means passing a higher product price on to the customer. Take your time, use a sharp marking knife, score lightly the first few passes, then remove the bulk of the waste with whatever method suits you. I chose to chop it out with bench chisels. It was mostly paring with just the occasional chopping, so I didn’t miss Pujols’ first home run. Or the third one, for that matter. 🙂 (It would probably be easier to motivate myself to find shop time if I got to listen to a game like THAT every time!) Then remove the final bit with a small router, like the Stanley #271. I started with the recessed bit on the edge of the board. Made a few light chops, then picked up the #271, set the depth (using that part of the lock itself to get the proper depth), clamped two pieces of scrap side pieces to either side of the area I was mortising (to better support the #271) and cleaned out the waste. It was remarkably easy and much safer and quieter than the palm router. Then I worked on the mortising of the inside face (this is the part that is easier when the box is not assembled). First I worked on the deeper inside mortise so I could still use the other area to further support the #271 when I was cleaning out the bottom of it. 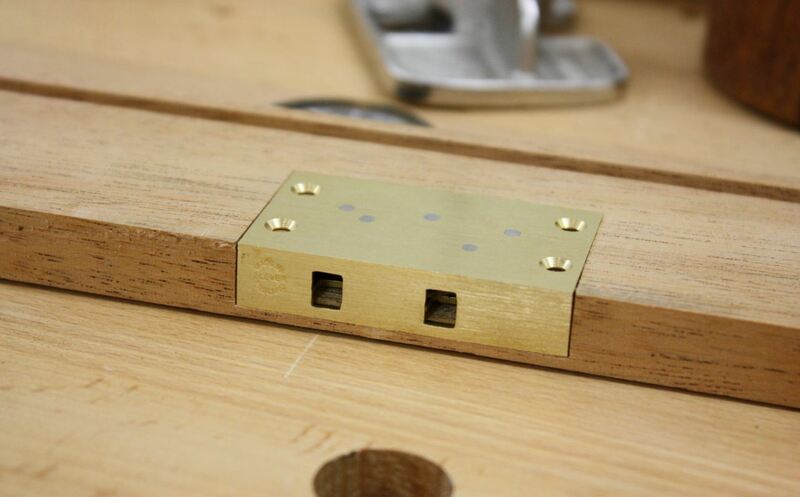 Then it was the top two ledges where the screws will mount it to the box. Before it can be pressed into place, you have to drill the hole for the lock pin. I used a pencil to put a bit of graphite on the pin, lined it up as best I could, and pressed it mostly into place. When I removed it, a small indentation with a smudge of pencil lead showed me where to drill. … and that’s a good thing. or enter “stopped grooves video” into one of the Popular Woodworking search boxes on their Website. If you are really interested in how other grooving planes “cannot” be used to help you make a stopped groove, you might want to start researching carriage makers’ plow planes. If you have a spare 043, and you do not object to tool modification, you could consider cutting down both the toe and the heel of the skate on a 043. If you’re really interested, you could start to study up on making a simple carriage makers’ plow. Thanks for your blog. I enjoy reading about your efforts. Ah… I should append my statement to say, “I couldn’t figure out how to make stopped grooves with my plow plane”, then! Will try to find a bit of time in the next day or two to study up on making stopped grooves. Thanks for the links/suggestions. I DO happen to have a second 043, and I’m not completely opposed to tool modification, but… quelle nightmare, Phil! Modify one of my 043s? Boy howdy, I’d have to have a few shots of whiskey before I could do that. And then I wouldn’t be able to work with any tools per the alcohol consumption. Not really a Catch 22, but a conundrum none the less! Nice post! Usually I just chop out the stopped section with a chisel then plow into the recess. I have played with some of the bullnose plow planes out there and they make it a lot easier, but honestly I usually design around it and figure out a way to make a through groove. Enjoyed this read, thanks a lot. Mortising with chisels is something I need to do more of so I’m more comfortable with it. I did use one of my eggbeater drills to drill out the stopped sections, though, so I didn’t TOTALLY revert back to power tools for the task. Hmmm… designing around stopped grooves… I’ll have to ponder the possibilities of doing that with what I want to accomplish here. Might not be easily done – but I’ll put some thought into it. Thanks to you for reading, as well! Maybe you could do a mitred dovetail, but put the mitre on the bottom so it hides the groove that you plow through while teh stock is still square? My first purpose is to get my own thoughts down into something concrete (er… as concrete as a blog entry can by, anyway). It helps me to solidify learned lessons in my head. That means I have less of a chance of repeating them. And I like to think that maybe someone else who’s just as new to this as me (after 5+ years, I still feel like I only know maybe 1% of what I need to know) can learn from my mistakes, as well. I try not to write thinking, “man, I hope someone is reading this so I’m not wasting my time.” But it’s cool to see I’m not just writing for me alone. Nice clean job! By the way, I have a bridge I’d like to sell you, blah, blah, blah. Cheap! Thanks! It’s always a joy when it works out just exactly the way it is supposed to. When that happens, I always take a moment to sit in silence and think it through once again to try and remember what I did and how great it feels when it goes smoothly. Yeah, about the bridge, though… I’ve been buying tools from Patrick for several years now, so there is a certain level of familiarity applied to our transactions at this point. He knows what I’m looking for, I know what he has to offer, blah blah blah. I once had a guy from a local “reputable” construction company try to sell me a 9×12 deck (that didn’t meet my specifications per he wanted to use plastic railing and I told him it had to be wood per the condo rules) for over $10k. I told him I could make it for less out of $1 bills and thanked him for wasting two hours of my time as I showed him the door. Oh, wait, were you serious? No, that wouldn’t really work in this application (whew! I’m still uncomfortable with the regular ol’ dovetails…). The box is a take on Greene&Greene, so I’m using very large slightly proud box joints for the joinery. In fact, that’s what I’ve been pondering the last two nights (while watching the Cards create a build-up of excitement in winning the World Series at home in Game 7). What is the best way to round the ends so they are uniform and it doesn’t take me 6 hours?